Uploaded by simonsugru SEND US YOUR BEST FIXES! Reinvent and reimagine your toys to make crazy and hilarious mash-ups! All thanks to beautiful Lego and sugru! The joy of using Lego is you can keep making wierd combinations - so you will never tire of your toys! - it sticks to almost anything from moshi monsters to spiderman! Please take note that sugru is not suitable for children in its uncured form - but as soon as it's cured - its ready for playtime! To start with you will want a selection of Lego in varying styles that do different things. We've found that the slimmer the Lego brick the better! Next up, take your toys and saw off limbs/heads/tails/torsos/feet etc. Don't think of it as killing your toys but as giving them new life! Cut open a minipack of sugru and tear off a small piece. Knead it in your hands for 30 seconds to get it warmed up. Next, roll it into a sausage and stick it to the bottom of the Lego and then sculpt it into a pyramid shape. 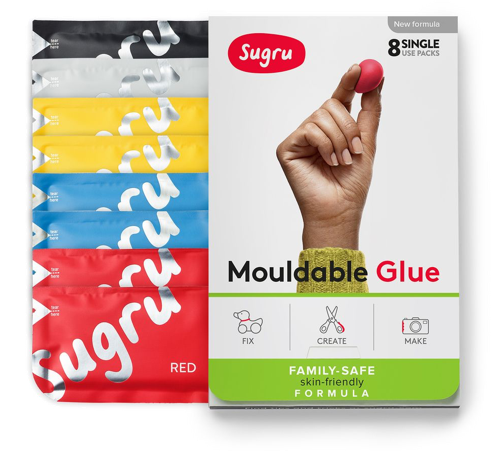 A pyramid shape allows the sugru the best possible even spread when it's pressed onto the toy. Press the Lego brick down onto the limb/torso etc. Here we have stuck it to this toy's head. In much the same way as before, knead, apply and sculpt the sugru. Be careful about which side you stick the sugru on - it all depends on what sort of combinations you want to make. Here we are sticking sugru on top so the head can connect with it. Push the Lego/sugru brick onto the body of the toy. Make sure the Lego is evenly placed and level. Leave him to cure for 24 hours too. Next up, we are modifying this wrestling toy. He's hollow inside so stuff this toy with tissue/toilet paper so sugru has a bigger surface area to bond to. Smear sugru over the surface that you want to put the sugru on. Using more sugru, build up the areas around the brick for an extra strong bond. You can do this by using the excess sugru from the sides or by making small sausages, applying it to the sides and then rolling your finger over it for an extra smooth finish. Leave this to cure for 24 hours. 24 hours later, the sugru has cured and your new toys are ready to go! ...the only limit is your imagination! Who knew?! LEGO minifigures hold charger cables perfectly.